One of Moldavia’s monasteries is so beautiful that art historians compared it to the Sistine Chapel. We are talking about the Voroneţ monastery, built by Prince Stephen the Great, proclaimed saint of the Orthodox Church, at the request of another Orthodox saint, Dani Hermit, the ruler’s advisor. At the heart of Voroneț lies a relatively modest-sized church, dedicated to St. George, which was built in 1488 in just three months and three weeks, a record for that time. Between 1488 and 1785, Voronet operated as a friary. After the monastic settlement was closed, the local parish took over the church. In 1991, the monastic life resumed as a convent for nuns. The legend of the founding of Suceviţa monastery says that all the stone required to raise the imposing structure was carried by a single woman and her oxen-drawn chariot for 30 years, in an attempt to redeem her sins. However, in reality, the monastery was founded by one of the most important aristocratic families in Moldova, Movilă, which gave the Moldavian and Wallachian people rulers, as well as Bishops for Moldova and Kiev. 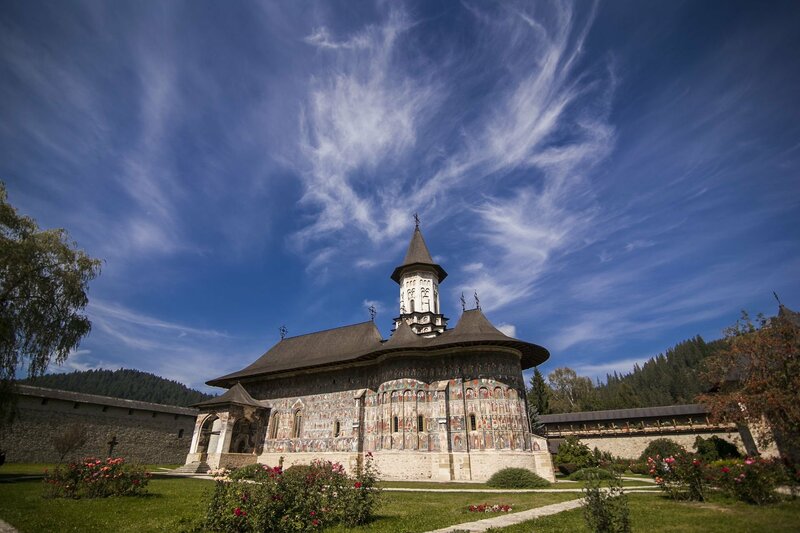 One of the most beautiful monasteries in Europe is the result of the collaboration between craftsmen from Moldova and Transylvania, during the rule of Petru Rareș, Prince of Moldavia, who also possessed major feuds in Transylvania. Moldoviţa Monastery is one of the most sublime expressions of the Moldavian Gothic architecture. In Moldoviţa, the first place of worship was built during the time of Prince Alexander the Good, in the early years of the fifteenth century. Nonetheless, this place of worship was destroyed, and in 1532, Petru Rareș decided to set up a new monastery, dedicated to the Annunciation. Humor is one of the most interesting monasteries in Moldova, founded by the great chancellor Toader Bubuiog. The church of the monastery was included on UNESCO’s list in 1993. The church is dedicated to both the Assumption of Mary and St. George, because it took over the patron of a prior place of worship. 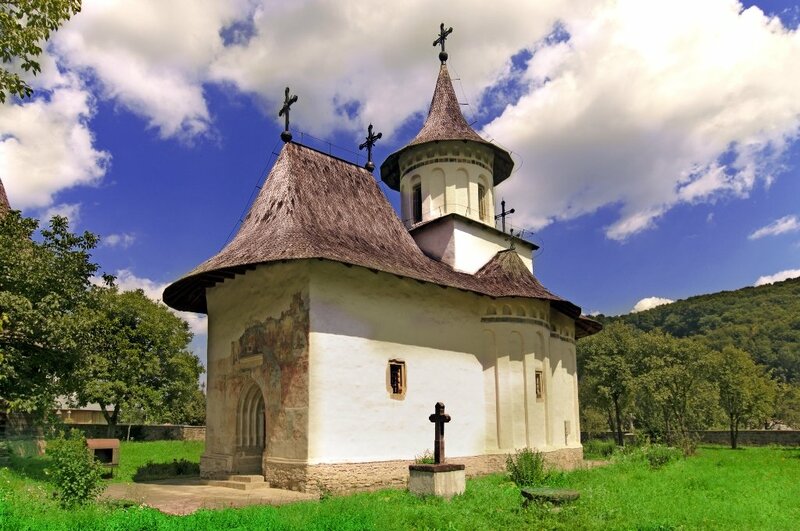 In the early Middle Ages, near today's Humor monastery, there was a monk hermitage which had a wooden church. During the reign of Alexander the Good (1400 - 1432), Humor’s feudal lord, the magistrate Ivan, built a stone church, and in 1473, Stephen the Great gave the church a Four Gospels Book, on which the prince is painted, while Mary offers him this book. 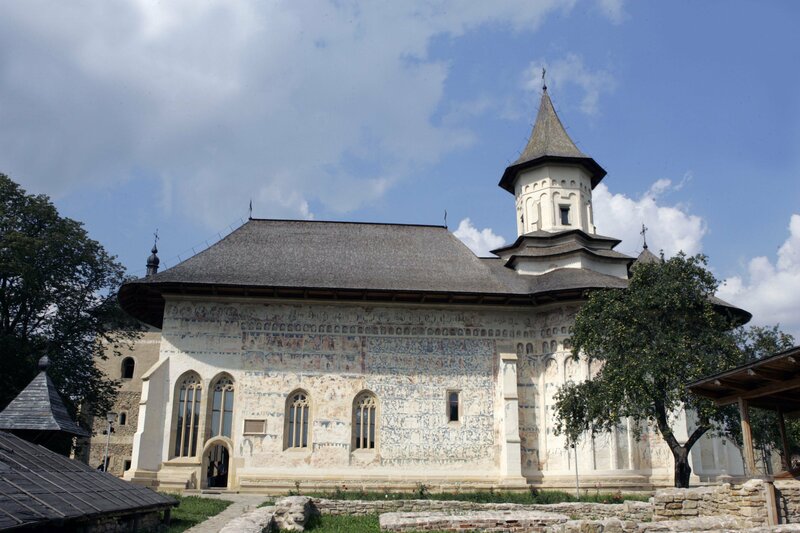 The history of Saint George’s Church in the monastery of Saint John the New in Suceava begins in 1514, when the prince of Moldavia, Bogdan III, decided to build a new metropolitan cathedral, after the old one had been destroyed by a Polish invasion. Bogdan III began construction of the church, which was completed in 1522 by his son, Ștefăniță Vodă. 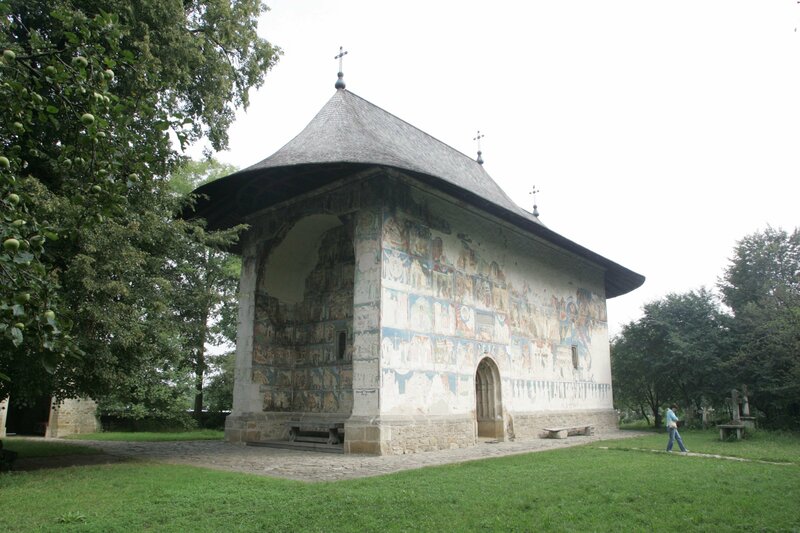 In the period between 1532 and 1534, the church was painted inside and out, at the request of Prince Petru Rares. In 1579, the Bishop Theofan of Râşca added a small porch. Between 1522 and 1677, this church operated as the Metropolitan Cathedral of Moldova. Even when Prince Lapusneanu moved the Moldavian capital from Suceava to Iaşi, from 1564 until 1677, the metropolitan residence remained in Suceava. A true monastic fortress rises in Probota. The monastery was founded in 1530 by Prince Petru Rareș, the son of Stephen the Great. From 1522, the church served as a royal necropolis. Here are buried the princes Petru Rareș and his son, Stephen Rareș, Petru's wife, Elena Rareș, and two noble offspring: Eftimia, daughter of Petru Rareș and Samfira, daughter of Stephen Rareș. The monastery was built in the vicinity of a wooden church, from the time of Prince Peter Muşatin, and a stone church, built by Prince Alexander the Good, where Lady Oltea, the mother of Stephen the Great, lies buried. The church of Pătrăuți, built in 1487 by the voivode Stephen the Great, holds the secret to a unique colour in the world. The Pătrăuţi Yellow is a sort of golden ocher, created by one of the Byzantine artists who fled here after the conquest of Constantinople by the Ottomans in 1453. According to the French Byzantinologist Andre Grabar, this was the artist George Trice. He settled in Moldova, where he had a pivotal influence on the Moldavian painting school. He died in 1530 in Moldova and is buried in St. George’s church in Hârlău. His most brilliant student was Toma of Suceava. 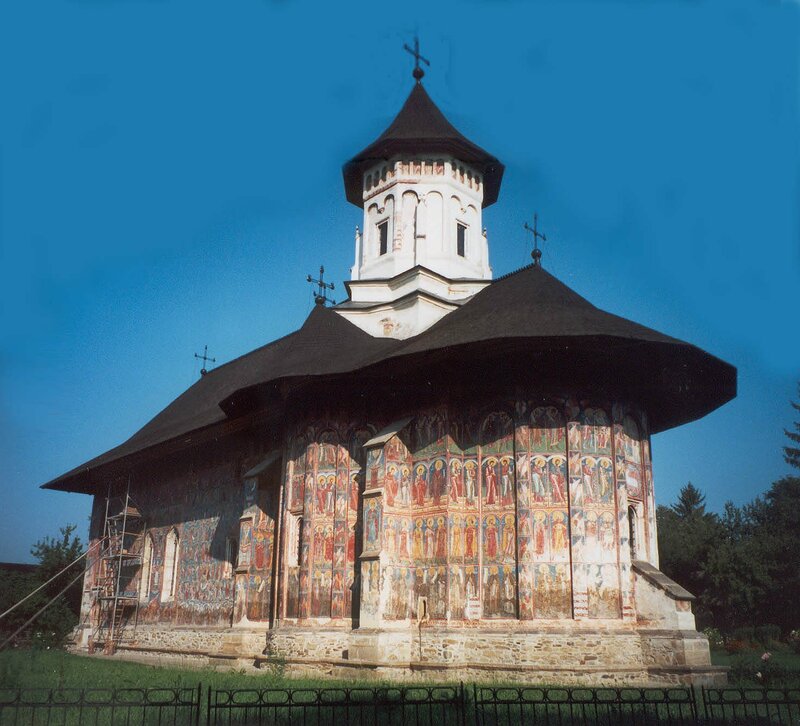 One of the most spectacular architectural monuments is the Moldavian Church Arbore. This place of worship combines the Byzantine tradition of worship sites with Western influences, filtered by the Catholic Poland. 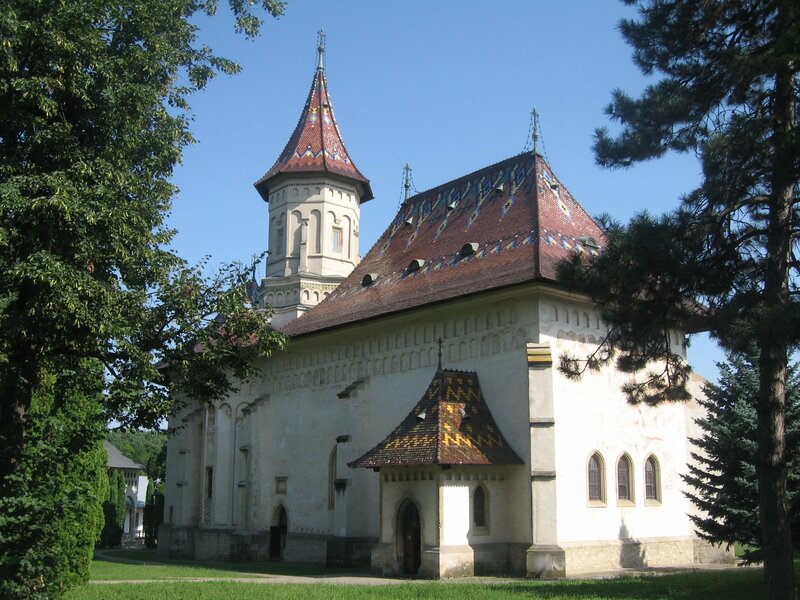 The church was built by the hetman Luca Arbore, the Moldavian army commander during the reign of Prince Stephen the Great, declared a saint by the Romanian Orthodox Church. Since 1993, this church is part of UNESCO’s world heritage. The founder of this church, Luca Arbore, was part of the high aristocracy of Moldova. His father was commander of the Neamt Fortress. In 1486, Luca Arbore became the commander of the garrison in the capital of Moldova, Suceava. He was one of the trusted men of Stephen the Great, and received the rank of hetman, namely, the army chief of the principality. He also held the position of commander under the reign of Stephen the Great's son, Bogdan the Blind. Then, he became regent of Moldova in the first period of the reign of Stephen the Great's grandson, Stefan Voda. However, later on, Stefan Voda killed Luca Arbore and his sons, Toader and Nichita, whom he accused of treason. Their memory is preserved in the old church of the village Arbore. Initially, it was an entire aristocratic residence, out of which only the church survived.